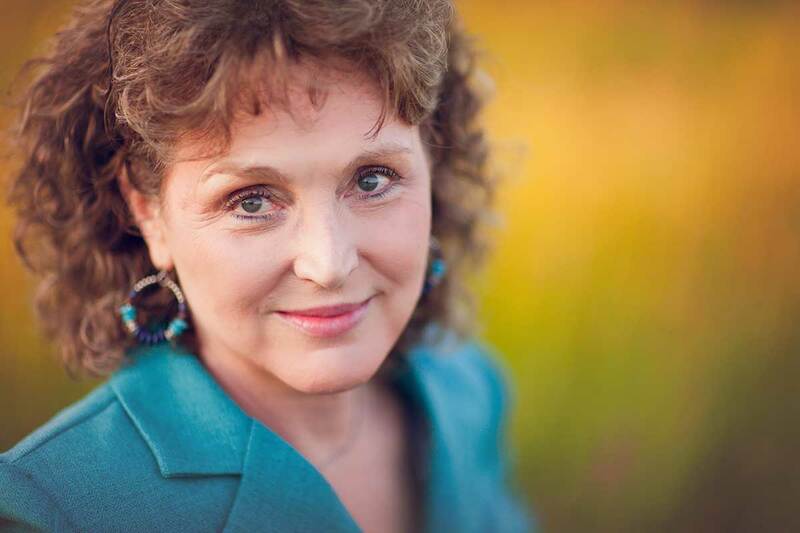 In a recent Wife for Life University class, a student excitedly reported a breakthrough conversation she had recently shared with her husband. I asked what she had learned from the experience and you know what she said? Woah! That was a first! The first time in all my years of teaching and mentoring that a woman had made that confession so plainly, so out loud, and in so few words! No insult or stereotype intended, but as any alien visitor to earth might observe as obvious-fact, we women DO excel, generally speaking, in word production. “Talking” is one of our best and most treasured talents, the one that slides off our tongue with the least effort. I for one, think the sound of women’s voices intermingling and undulating up and down, faster and slower, louder and softer, is as soothing and as lovely as a babbling brook. Mother Nature is, after all, as noisy as the next girl, which naturally leads to the scientific conclusion that she must be the one who bequeathed six to seven language centers to my feminine brain. And the genius who gave my husband one. Language center. One. That’s right. Out of the hundred plus ways male and female brains differ in processing, chemistry, structure, or activity, this particular contrast is definitely a stand out: men, generally speaking, have one or two areas of their Command-Central roped off for language, while the rest of the masculine brain (again, in very general terms) remains dedicated to spatial calculations (for beautiful reason BTW). Sooooo (I hear you saying), that explains it! That’s why my guy stares at me with an expression of no-expression when I’m expressing—myself. That’s why he sometimes looks tired, or bored, or overwhelmed with me. That’s why he occasionally hums and ha’s or even cringes when I ask to “have a talk”. And that’s why he gets testy or discouraged when I finish his sentences. Actually, yes. At least partly. There is, of course, a lot of other factors at play, including personality, upbringing, relationship history, and couple dynamics, but at the baseline, you are a woman and he is a man, and generally speaking, you process words (especially verbals) in a different way, for a different reason, and more often than not, at different speeds. A comedic (albeit exaggerated) illustration of what we’re talking about here. So, what’s a girl to do? How best to either bring him up to speed or accommodate his linguistic preferences? I have just three (out of 103) ideas for you today. First of all, ask him to weigh in. What this tactic really boils down to is simply taking a breath. If you were driving, I’d tell you to share the road. Just as my Wife for Life University student discovered and shared with her classmates, there is great relational power in taking the time (and breath) to actually encourage his participation in your ongoing too-often-too-lop-sided conversation. How do you do that? Easy. Just ask him to weigh in. Solicit his opinion. Request his help solving a problem. Inquire into a something-or-other that he can teach you something-or-other about. Then listen attentively and respectfully (sans the debate or argument). Steer clear of complex relational issues here, and don’t expect him to dive deep into an emotional exchange (that’s another whole lesson and skillset). What we’re talking about in this approach is setting the stage for a pleasant, mutually beneficial, mutually rewarding conversation between the two of you. Sounds nice, doesn’t it? It is. Just slow down your tongue and open up your heart and your head. Second, talk to the Big Dog. There’s even greater power in keeping conversations brief; especially when they involve expressing a need you may have, including a listening ear. My husband, for instance, prefers that, when possible, my expectations be stated before my explanations, right up front; he calls it “talking to the big dog” (a reference to a way of doing business). To his great exasperation, I have a tendency, like most women, to justify a simple request with a long, sometimes contorted exposition that winds into the finale: “So, I need…” or “So, will you…” Laying out the background information makes sense to me, but the fact is, his natural response is to get antsy, tune me out, or jump to the wrong conclusion—all of which are extremely aggravating to a wife who needs his attention and sympathy. All I have to do to avoid that is make my case (in most instances) by stating my objective at the start. I do not have to spell out why in the context of this kind of conversation. He really just needs (and appreciates) the basics. And thirdly, don’t forget that silence can be golden. As a woman, you may bond verbally, but your husband can bond with you just by sharing a space with you. Ever notice how pleased he seems when you watch him engage in some activity, such as playing a sport or working on the car? He also likes it when you simply sit beside him in quiet contentment. 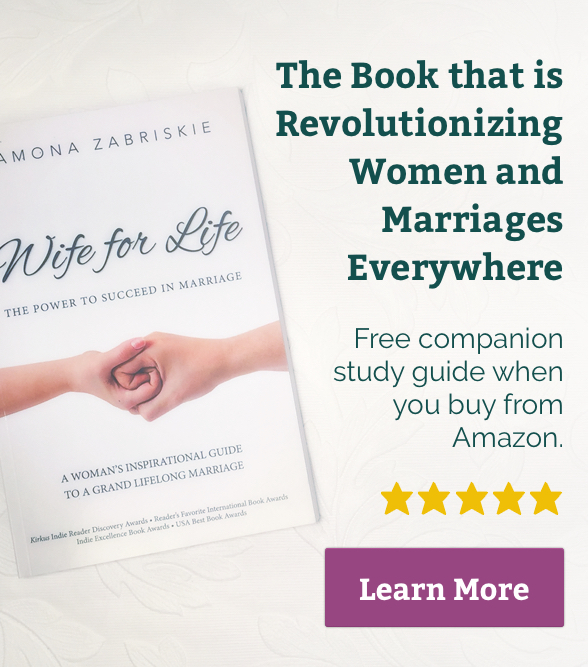 One wife told me how her marriage transformed when she stopped emotionally bombarding her husband with logistics and information at the end of a long day and instead just sat with him as he played his guitar. Not only did he deeply appreciate this mode of bonding, she felt romanticized and soothed as well. Maybe that’s what they mean by “pick-a-little talk-a-little”? Question: when will the male version be done? Thank you Cheryl! Still in research and development! Also, please explain what “complex, rational issue” means. Hi Cheryl! Thank you for commenting on the blog today! May I ask where “complex, rational issue” comes from? Do you mean to quote the blog post? “complex RELATIONAL issue”? If so, that means an issue between the two of you (having to do with your relationship) that is deep-seated, hot-buttoned, maybe ongoing. Things like that NEED to be talked about, but this particular article and approach doesn’t address it. 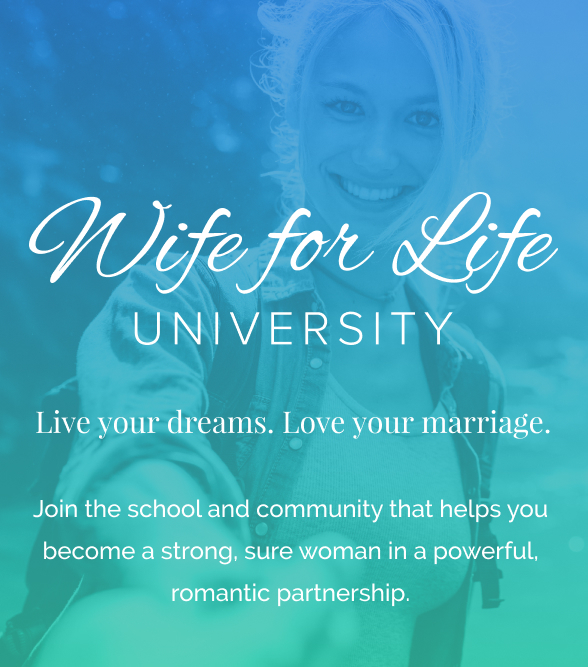 That is the kind of thing, though, that we get into at Wife for Life University. You are welcome to write to me personally if you need to! 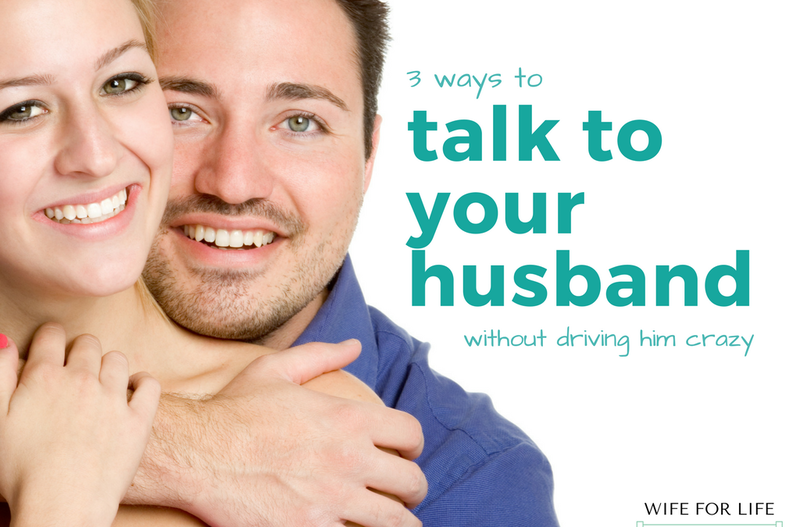 What if your husband is the one who does all the talking? Even for long periods of time? I’ve timed him on many occasions and sometimes he will go on for over two hours without stopping. It leaves me physically, mentally, and emotionally exhausted. Thank you for this blog. I am a very auditory person and being instructed on the differences in language centers between mine and my husband’s brains will help me to talk less and be more patient and accommodating. I love your blogs and am so grateful to have found, you, Wife for Life, and Wife for Life University.